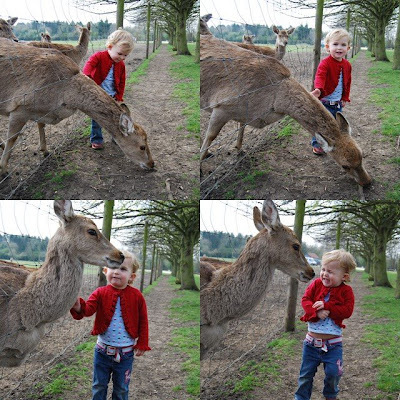 We took PreciousFirstBorn and NeglectedSecondChild to Mole Hall Wildlife Park a week or so ago. We sold the idea to ThingOne by telling her there might be flamingos there (we know better than to promise anything for sure as her disappointment would have been enormous had they all died out the previous week). "We're going on a flamingo hunt" we said. "We're gonna catch a big one" ThingOne continued. When we saw the pink birds though ThingOne was more interested in a nearby duck. ThingOne doesn't have much concept of what is rare or unusual and what is ordinary (despite seeing ducks regularly) as she sees flamingos, giraffes, lions etc every day in numerous books (and I occasionally just search for 'tiger' on Flickr and leave her in front of a slideshow of the results if I need to get something done - Flickr is grrrrrrreat). 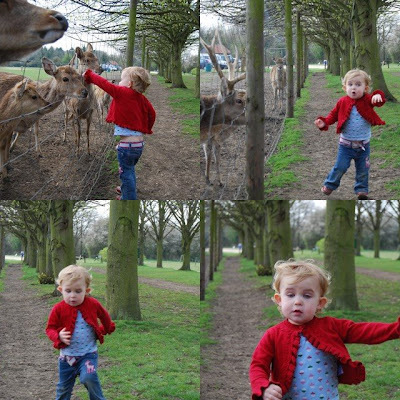 We had a really nice morning there (and were the only people there for most of the time) and ThingOne loved feeding the deer through the fence. Having been impressed by a chimpazee walking on all fours, ThingOne did the same in a sandpit later. "Are you being a chimpanzee ThingOne?" I asked. ThingTwo spent most of the morning in a sling, and perfectly content. She doesn't seem to get much attention, poor girl. Babies seem easy next to toddlers (except today when ThingTwo's had a few screaming sessions - the start of the road to teeth being to blame, we think). 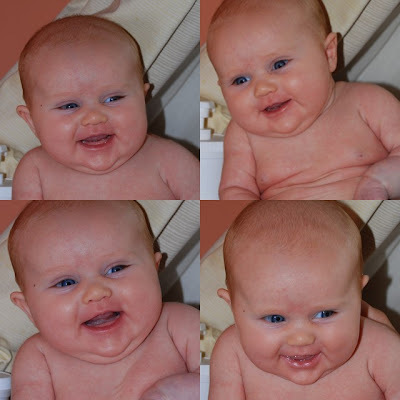 Here are a few shots of the newer little monkey in our pair showing off her gummy grin. ThingOne barely laughed for her first six months, whereas this one is showing signs of being a giggler already (probably having realised she'll need to compete).